Mix brown Sugar and Soy sauce together in a bowl. They should combine nicely into a soupy soy liquid. Put Deer Loin in a cooking tray and pour Brown Sugar/Soy Sauce mixture over loin. 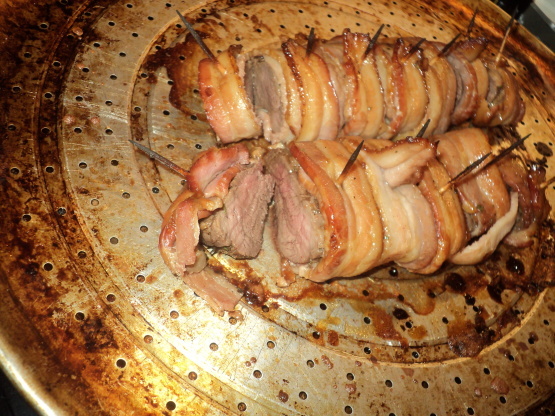 Roll tenderloin over in mixture, completely covering it. Let meat marinate in mixture at least 3 hours or overnight in fridge. It’s best to marinate for 8 hours if you have the time. Also GREAT to use a Food Saver or other Vacuum device to Vacuum pack/seal the meat with Marinade. With this method, you can achieve Overnight-level marinade in just a couple hours! Remove loin from tray, and place on a slotted bake sheet with a drip pan or aluminum foil below to catch dripping. Don’t throw away marinade. Wrap a piece of bacon around the very end of the tenderloin, securing the bacon strip with a toothpick. Repeat this process until the entire loin is wrapped in ten or so bacon “loops.” The tenderloin should look like an arm with a bunch of wrist watches on it, the watches being the bacon strips. Drizzle remaining marinade over deer loin. You can continue to baste the loin with the marinade throughout the cooking process with either a brush or a turkey baster. Place on center rack in oven and bake at 350°F for 30-40* minutes. *This should cook the meat to about Medium. For those of you who prefer rare meat, cut the time to 25-30 minutes and then follow with the “OPTION 2” step below regarding searing. OPTION 1 – with about 10 minutes of cooking time left, you can lightly dust the top of the loin with white sugar. 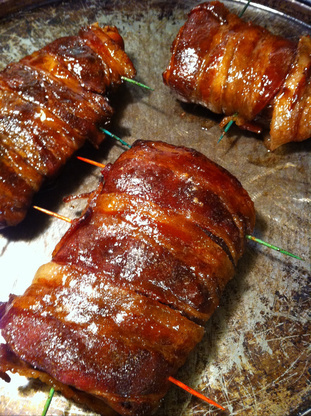 This creates a sweet crust on top of the bacon. Might be too sweet for some. Try doing it on just HALF of the loin to see if you like it! 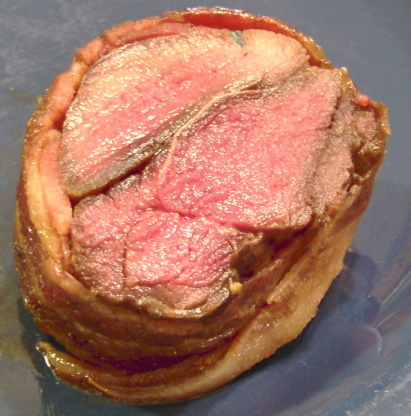 OPTION 2 – For a crispier crust and crispier bacon, remove Loin from oven and place the Loin(s) directly on a Grill over medium-high heat to sear the bacon and outer loin. Remove from oven and place on cutting board. Using a knife, cut the loin between each strip of bacon so that you have many pieces of meat, each with their own toothpick. You can eat these pieces directly from the toothpick or remove the toothpick and eat like steak. With most of you finished your bear hunt, here’s a great idea for something fantastic to do with your harvest that everyone will love! Rub meat with plenty of salt (celery salt is preferable) and black pepper. Place in kettle with plenty of water and salt pork, garlic and black coffee. water – drain and the meat is ready for cooking or preserving.